We’d love your help. Let us know what’s wrong with this preview of Chemistry by Weike Wang. Three years into her graduate studies at a demanding Boston university, the unnamed narrator of this nimbly wry, concise debut finds her one-time love for chemistry is more hypothesis than reality. She's tormented by her failed research--and reminded of her delays by her peers, her advisor, and most of all by her Chinese parents, who have always expected nothing short of e Three years into her graduate studies at a demanding Boston university, the unnamed narrator of this nimbly wry, concise debut finds her one-time love for chemistry is more hypothesis than reality. She's tormented by her failed research--and reminded of her delays by her peers, her advisor, and most of all by her Chinese parents, who have always expected nothing short of excellence from her throughout her life. But there's another, nonscientific question looming: the marriage proposal from her devoted boyfriend, a fellow scientist, whose path through academia has been relatively free of obstacles, and with whom she can't make a life before finding success on her own. To ask other readers questions about Chemistry, please sign up. how is the language in this book? I don't like too many cuss words. Taut novel, tight prose. Fascinating approach to telling a story. Lots of ambition here. Found myself so frustrated and willing the narrator to make the choices I wanted her to make. So many lovely moments and turns of phrase. Interesting ending. Liked this book very much. Here's a bit of a cautionary tale for those of you who might put too much pressure on your children to succeed academically, or those of you who push yourself too hard. "The optimist sees the glass half full. The pessimist sees the glass half empty. The chemist sees the glass completely full, half in liquid state and half gaseous, both of which are probably poisonous." Chemistry is spare and slightly quirky, yet it is surprisingly profound and moving I'm between 3.5 and 4 stars, so I'll round up. Chemistry is spare and slightly quirky, yet it is surprisingly profound and moving. The unnamed narrator of Weike Wang's debut novel is a PhD student in chemistry at a university in Boston. She's been at her studies for several years and hasn't yet had the research breakthrough that will lead to her completing her dissertation, receiving her PhD, and hopefully getting a job, much to the chagrin and frustration of her Chinese parents, who will accept nothing less than success from her. They don't want excuses, delays, explanations—if she doesn't get her PhD, she's no longer their daughter. "Ninety percent of all experiments fail. This is a fact. Every scientist has proven it. But you eventually start to wonder if this high rate of failure is also you. It can't be the chemicals' fault, you think. They have no souls." As if her academic challenges weren't enough, her longtime boyfriend Eric has proposed marriage. A fellow scientist, Eric has followed his academic dreams without any challenges, and is on the cusp of getting a teaching job somewhere other than Boston. He doesn't understand why she can't accept the possibility that perhaps chemistry, and maybe even science altogether, isn't right for her. All he knows is how right they are for each other, so he can't fathom why she won't accept his proposal and go with him wherever his job takes him, and stop allowing her parents to rule her life. But how can she give up her dreams to follow Eric, without giving her work all she has? Can she actually make a life with someone who has never had to struggle, whose parents support his every move, and give him the self-belief he needs? When the pressure becomes too much to bear, she makes a split-second decision that changes everything. And now she has no idea what she wants, from her career, her relationship, her parents, or herself. Should she teach? Should she marry Eric and/or move with him? Should she tell her parents how she really feels, or work to finally make them proud of her? The dilemmas she faces turn her into a wholly different person, one she doesn't always recognize or even like. "Eric has said that I carry close to my chest a ball of barbed wire that I sometimes throw at other people." I found this really fascinating. Wang's narrator tells the story in the style of a person for whom English is not her first language, so at times the narrative is very spare and/or stilted, but the use of language and imagery really works here. The narrator doesn't come across as the warmest person, but Wang gives glimpses of her vulnerability and the emotion beneath the steely surface she has built to defend her from her parents and from those who don't believe women have a place in science. Chemistry is definitely a quirky book that might not be for everyone. As she seeks to find answers to problems for which answers aren't always readily available, she is finding her way, with sometimes comical, sometimes emotional, and sometimes stoic results. She's a flawed character but one with surprising sensitivity, and you get to understand why she hides that away. Don't let the title scare you. I got a "D" in high school chemistry (hope my mother doesn't read this) and vowed never to deal with that subject again, but I still found this a really compelling, beautifully told read. 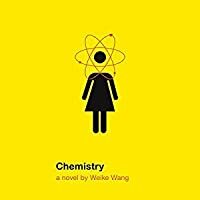 One of the best novels I have read in 2017, Chemistry won me over with its earnest depiction of a Chinese American woman struggling to navigate her 20s. Our unnamed protagonist has always lived by the mantra "you must love chemistry unconditionally." She runs into trouble when, partway into her prestigious Chemistry PhD program, she encounters failure through a series of unfortunate events. To make matters worse, her kind and intelligent and successful boyfriend Eric has proposed to her - but our narrator does not want marriage at the moment, much to Eric's chagrin. With great fear and uncertainty, our narrator embarks on a journey to discover what she wants for herself, outside the opinions of the academy, her parents, and her boyfriend. I loved how Chemistry captured its unnamed protagonist's search to find herself. While this type of plot could fall into cliches under a less talented writer, Weike Wang proves herself by creating a narrator with a distinct, flawed, and insightful voice. 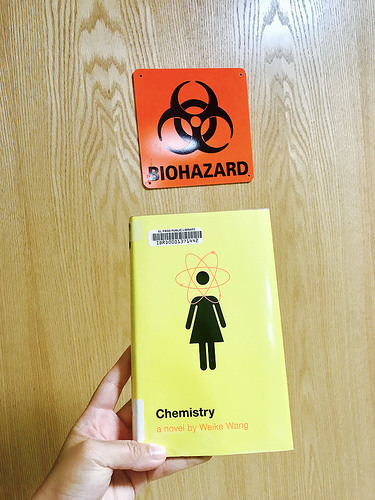 Wang sprinkles in chemistry references throughout the book to show how this subject matter has pervaded our protagonist's life; you do not have to enjoy chemistry to appreciate the quirkiness and humor this stylistic choice adds to the novel. Chemistry will resonate to an even deeper level with those who have encountered failure in a high-pressure academic or work setting, as well as those who have complicated relationships with their Asian American parents. I most enjoyed how Wang approaches the narrator's relationship with her parents with startling empathy and sensitivity. She included so many poignant scenes that touched on themes of cultural misunderstanding, Asians' experience of racism and acculturative stress, and the complicated ties between parent and child that made my heart ache in the best way possible. LINK TO MY FULL VIDEO REVIEW IS HERE! The way I feel about this book is why representation in books matters. Some themes include being raised in a collectivist culture (China specifically, and growing up in a country that places intensely high value on academic achievement - look up "gao kao", a series of tests after students finish high school that determine the good majority of their future, and the pressure that parents place on their children), and moving to a country that has more individual LINK TO MY FULL VIDEO REVIEW IS HERE! "A Chinese proverb predicts that for every man with great skill, there is a woman with great beauty. The first so beautiful that when fish see her reflection they forget how to swim and sink. The second so beautiful that birds forget how to fly and fall. The third so beautiful that the moon refuses to shine. The fourth so beautiful that flowers refuse to bloom. I find it interesting how often beauty is shown to make the objects around it feel worse. This proverb is said and resaid on the day of my parents' wedding." I never know how to write reviews about the books that I love the most. The ones that reach into the deepest darkest parts of my soul and change me. I know that this book isn't for everyone. The prose to me is nothing short of perfection but it is incredibly spartan. It's non-traditional in its execution of plot, of timeline. It never truly resolves any aspect of the storyline but to me it's all the more beautiful for that. It feels like a very honest snapshot of a life. The book has an unnamed female narrator who is a chemistry PhD student and it's these studies that are the catalyst for this novel. Her research is failing, she's struggling with her love for the subject and is battling insecurities surrounding her capabilities. Words can't express how much I understood and was thoroughly moved by what I was reading about. Research is all I've ever wanted to do but due to health reasons it can't be my path in life. Or at least not for the foreseeable future. I will always keep my hopes alive. But for an all too brief time it was my life and this book broke my heart because of that. Because in this book the unnamed narrator has to step back. She steps back for different reasons than I had to but I still felt it. I felt her story as if it were my own. And that's what's wonderful about this book. The unnamed narrator is the most human character you could ever read about. She's so honest. Brutally honest. She's incredibly insecure. At times unlikeable even. She's got a unique sense of humour and is plagued with guilt. Guilt stemming from a need to succeed and that need not coming to fruition. "In Chinese, there is another phrase about love. It is not used for passionate love, but the love between family members. In translation, it means I heart for you." This need to succeed is seemingly tracked back to her rearing. She is the child of Chinese parents living in America. And their overzealous values on education and success haunt her to the extent that she can't function without them. Her life is not her own. Everything she does is for her parents more than her. To the extent that her boyfriend can't quite understand how she doesn't just free herself from their shackles as she is a grown woman. And when he asks her to marry him things get even more confusing and the pressures and stresses of expectation build up even more on her. "The moment we're back in our old apartment, he asks the first question again. Say yes. He asks the second question. Come with me. Isn't it enough that I want to?" I guess you could say this is yet another of those books about a lost twenty something searching for the answers to life's big questions. But to me this is so much more than that because of the authenticity of the unnamed narrator. How we get to live inside her brilliant mind; how she is hopelessly flawed with her approach to everyday life and yet is deeply incisive about the greater questions of life. I love this character with all my heart. And thusly I love this book with every fibre of my being. When I stumbled across the blurb for it many months before its release I was optimistic that it would be a book that I would find enjoyable. The blurb spoke to me and I had to go to a lot of effort to track down a copy including spending A LOT more money than I would ever normally spend on a book especially one that I hadn't read reviews of or knew anything about the author. And now I am so glad that I spent that time and effort locating a copy of this. I would urge anyone with a love for intelligent and quirky literary fiction to locate a copy of this for themselves. I have a hardback edition but the paperback is due sometime in the spring. I'm torn as to whether or not this is my favourite book of 2017. It's between this and A Line Made by Walking. I have a little over a month to decide but my inkling is that this will take top spot. I am bereft of words but so full of emotion right now. This was truly stunning. So sparsely written but still somehow saying so much. I didn’t love Chemistry but it kept me curious enough to want to finish reading it. I remember reading many mixed reviews on this book when it was first released and it’s easy for me to see why. The narrator is an unnamed woman living in Boston, completing her Ph.D. in Chemistry. She lives with her boyfriend, Eric, who is also in school. She questions herself in multiple aspects of life, both personal and professional. While I can appreciate that people change their minds every day about big dec I didn’t love Chemistry but it kept me curious enough to want to finish reading it. I remember reading many mixed reviews on this book when it was first released and it’s easy for me to see why. The narrator is an unnamed woman living in Boston, completing her Ph.D. in Chemistry. She lives with her boyfriend, Eric, who is also in school. She questions herself in multiple aspects of life, both personal and professional. While I can appreciate that people change their minds every day about big decisions, and are entitled to do so, I felt she was complacent for a fair portion of the book. Wondering, going through the motions, and kind of sitting idle. Not my style in real life, or to typically read about, but the book was short so I continued. The story is told in first person by the narrator and told in skittish, sporadic spurts. I found them to be skittish at least. Bits and pieces - jumping from subject to subject - following a somewhat chronological timeline, dispersed with frequent flashbacks. Her parents place immense pressure on her to succeed, and have their own rocky relationship. Her best friend is dealing with problems, which she seeks discussion and analysis about, and Unnamed must also face her own reality regarding the future. The story includes some chemistry references, however as a science novice, these were not too complex. I felt they added to the overall story. I admit I am weary of novels about directionless twenty-somethings, they are often boring and derivative. But CHEMISTRY has a controlled sharpness. It is jagged. It never lets you fall into a rhythm and I love it for that. It takes the entire book to really understand the narrator, how she is hurt and how she tries to love, and even in her narration she will draw you in and then push you away. I studied Chemistry in college. Every bit of science (and there is a lot) rang true. Maybe the narrator I admit I am weary of novels about directionless twenty-somethings, they are often boring and derivative. But CHEMISTRY has a controlled sharpness. It is jagged. It never lets you fall into a rhythm and I love it for that. It takes the entire book to really understand the narrator, how she is hurt and how she tries to love, and even in her narration she will draw you in and then push you away. I studied Chemistry in college. Every bit of science (and there is a lot) rang true. Maybe the narrator has a few too many pieces of trivia ready at a moment's notice, but it's minor. The struggle of being a smart person driven to succeed who suddenly realizes that all the drive in the world can't necessarily make success happen is a real one. It can be the central question of a person's life and it's a shock to encounter it in your 20's. Add to that the imperative that comes with being a child of immigrants who demand success and nothing else, and it's easy to see how our narrator gets adrift. In much of the same vein as Sigrid Nunez's, THE FRIEND, Weike Wang's CHEMISTRY is a short novel chocked full of incredible insight, philosophical witticisms, and dynamic personal narrative. For all of the major thinking that this novel will make you do, it will also make you laugh out loud as you consider its bigger questions. Wang's prose is sharp, honed, and pleasingly economical—there's no fluff here—just the essentials. Though the plot itself doesn't break the mold—a bildungsroman focused on In much of the same vein as Sigrid Nunez's, THE FRIEND, Weike Wang's CHEMISTRY is a short novel chocked full of incredible insight, philosophical witticisms, and dynamic personal narrative. For all of the major thinking that this novel will make you do, it will also make you laugh out loud as you consider its bigger questions. Wang's prose is sharp, honed, and pleasingly economical—there's no fluff here—just the essentials. Though the plot itself doesn't break the mold—a bildungsroman focused on an aimless young female immigrant teetering between the wishes of her parents, her boyfriend, and the world at large—CHEMISTRY feels entirely new. Whether it is its deeply introspective style, or the seemingly effortless humor that blends so well into the prose, Wang has found a true sweet spot here. This is my favorite type of novel: heady, philosophical, hilarious, and highly aware of when it shouldn't take it self too seriously. Weike Wang’s debut novel is a patchwork of the narrator’s internal monologue, memories from her painful childhood, and vignettes of her relationship with a fellow graduate student. Oh, and scientific factoids. Despite how disjointed and piecemeal that sounds, it all comes together into a flowing, almost hypnotic read. The narrator (never named) has a perfectly nic Is it bad to relate super hard to a narrator that other reviewers describe as “unlikable”? Asking for a friend. Follow https://booknationbyjen.wordpress.com for all my reviews and recommendations. 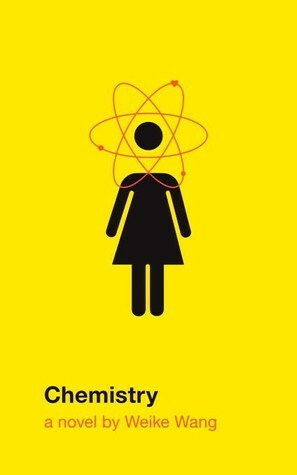 I was pleasantly surprised at how much I loved this book titled Chemistry! Author Weike Wang’s unnamed narrator, a Chinese-American Ph.d. student, lives with her redheaded boyfriend behind her traditional parents’ backs. Despite the high expectations for their daughter to become a chemist, she is unable to be successful in her research, losing interest in her male dominated field and having difficulty making deci Follow https://booknationbyjen.wordpress.com for all my reviews and recommendations. I enjoyed reading this story. The main character and narrator is unnamed, she is a doctoral student in Chemistry who lives with her boyfriend Eric. She is Chinese-American and arrived to the U.S. with her parents when she was 6 years old. That is the main plot, but what the author does wonderfully is take us in a journey through the thoughts of the main character and listen to her inner dialog about the struggles with her relationships, parents, studies, and life in general. The book is well writ I enjoyed reading this story. The main character and narrator is unnamed, she is a doctoral student in Chemistry who lives with her boyfriend Eric. She is Chinese-American and arrived to the U.S. with her parents when she was 6 years old. That is the main plot, but what the author does wonderfully is take us in a journey through the thoughts of the main character and listen to her inner dialog about the struggles with her relationships, parents, studies, and life in general. The book is well written, the narrator talks about many subjects but mostly about science, her relationship with her perfectionist parents, and the Chinese culture she has been exposed to, these science facts and experiences is was what kept me interested and engaged. You will hear passages such as "Antipasto is not-pasta, like antimatter is not-matter" and "An atom is mostly made up of empty space. If you remove the empty space from every atom, the entire world's human population could fit inside a sugar cube." She also talks about Gattaca which is one of my favorite sci-fi movies. Overall I enjoyed reading this book and recommend it to those who love character-driven books. "It was once believed that heart cells could not regenerate, that once they died they could not be replaced. Now it is known that the heart can renew itself. But the process is very slow. In an average person, the rate is 1 percent each year." These sentences. They are choppy. The reader. She does not like them. The plot. It is thin. 3.5-4 stars. The narrator of this short novel has pushed herself for years academically, and now she's in a PhD chemistry program, and nothing's working out. Her experiment is a long series of failures, her boyfriend's asked her to marry and she can't seem to bring herself to say yes or no. And she holds such anger and pain in herself from the exceedingly high expectations put on her by her parents, who emigrated to the US from China years ago. The narrator's mother was deeply angry and frustrat 3.5-4 stars. The narrator of this short novel has pushed herself for years academically, and now she's in a PhD chemistry program, and nothing's working out. Her experiment is a long series of failures, her boyfriend's asked her to marry and she can't seem to bring herself to say yes or no. And she holds such anger and pain in herself from the exceedingly high expectations put on her by her parents, who emigrated to the US from China years ago. The narrator's mother was deeply angry and frustrated by her new experiences in her new country, and her father strove to excel as an engineer. The two parents fought constantly, and always expected perfection from their daughter. The narrator's tense childhood and parental expectations hit a little too close to home for me, and I found myself constantly putting the book down to take a break from the feelings the narrator obliquely expressed through funny or sarcastic comments to her boyfriend. The author expressed the constant push-pull in the narrator's head by the Chinese attitudes mixed with the N. American attitudes well; I kept finding the observations to be dagger-point sharp. Chemistry is a difficult book to describe, but I was very glad I read it. Weike’s unnamed protagonist embarks on a soul-searching journey to find herself. Unmoored by her lack of success in the scientific realm and her indecision about whether to accept her boyfriend’s marriage proposal, she begins therapy and pursues a job as a science (specifically chemistry) tutor. The format of Chemistry really appealed to me. The story jumps around a fair amount in sync with the protagonist’s scattered mind Chemistry is a difficult book to describe, but I was very glad I read it. Weike’s unnamed protagonist embarks on a soul-searching journey to find herself. Unmoored by her lack of success in the scientific realm and her indecision about whether to accept her boyfriend’s marriage proposal, she begins therapy and pursues a job as a science (specifically chemistry) tutor. The format of Chemistry really appealed to me. The story jumps around a fair amount in sync with the protagonist’s scattered mind. As Chemistry progresses, we learn about her early life and her strained relationship with her perfectionist parents. As each tidbit is divulged, it becomes easier and easier to understand her decision paralysis. Throughout the story, she uses chemistry references for almost everything she does or teaches to her students she tutors. I loved that aspect of the book so much. While Chemistry is only 211 pages, I did not find it to be a very quick read. The story is incredibly thought provoking, occasionally heartbreaking and always incredibly intelligent. Thanks to Alfred A. Knopf for the chance to read this amazing ARC. Chemistry was without a doubt my worst subject in high school. I have such a lingering resentment toward it that I almost dismissed Chemistry the novel for its title alone, but I was able to put my hatred of the subject aside long enough to really enjoy this - though I'm not sure 'enjoy' is the right word. This is an incredibly intense book, and I felt like I wasn't able to truly come up for air until I'd finished it. Chemistry is The Bell Jar meets The Vegetarian but also something a bit lighter Chemistry was without a doubt my worst subject in high school. I have such a lingering resentment toward it that I almost dismissed Chemistry the novel for its title alone, but I was able to put my hatred of the subject aside long enough to really enjoy this - though I'm not sure 'enjoy' is the right word. This is an incredibly intense book, and I felt like I wasn't able to truly come up for air until I'd finished it. Chemistry is The Bell Jar meets The Vegetarian but also something a bit lighter, quirkier. It doesn't indulge in the same gory details of the two I just compared it to - this isn't a book about psychiatric wards and forced hospitalization. Our unnamed narrator begins seeing a psychiatrist of her own free will, tries to make sense of the reason she can't seem to commit to her long-term boyfriend, or the reason she just walked out on her PhD program at a prestigious university in Boston. It's about her journey learning to trust, learning to give herself to another person while not compromising what she was raised to believe. Weike Wang takes the traditional disintegrating mental health narrative and propels it into uncharted territory, by chronicling the mental breakdown of a young Asian American woman. The novel examines the ways that her upbringing - born in China, raised in the U.S. by Chinese immigrant parents - influenced the way she navigates adulthood, and the struggles that have arisen for her because of it. The prose is spare and concise, but it isn't simplistic. This is a very technically well crafted book, which plays with a fusion of tenses, past and present narratives often coexisting in a single paragraph. Though the large font and just-barely-200-pages makes it tempting to breeze through this, speed read Chemistry at your own peril. This is such a richly detailed book that you need to really slow yourself down in order to get everything out of it that Wang intended. It was initially tough finding my way amidst the choppy verse. It’s disjointed and scattered - which makes sense as the narrator finds herself torn. Living up the the expectations that come with being a second generation Asian, navigating the perils of her Ph.D and trying to figure out what to do with the marriage proposal from her entirely devoted and loving boyfriend. Like Jill Alexander Essbaum’s Hausfrau, where the rules of grammar spill into the how that narrator navigates her relationships It was initially tough finding my way amidst the choppy verse. It’s disjointed and scattered - which makes sense as the narrator finds herself torn. Living up the the expectations that come with being a second generation Asian, navigating the perils of her Ph.D and trying to figure out what to do with the marriage proposal from her entirely devoted and loving boyfriend. Like Jill Alexander Essbaum’s Hausfrau, where the rules of grammar spill into the how that narrator navigates her relationships in the real world, our narrator here can’t help but throw out scientific asides. But it just wasn’t gelling for me until I got past the halfway point. I started to find my bearings - or maybe our narrator managed to draw on some meagre strength of her own that helped straighten out the narrative. This novel has all the charm of a very long bus ride through a monotonous part of town when all you have to read are the advertisements for teeth whitening products posted above the luggage racks. If it had been written by a 12 year old I would have been amazed however. Life choices. Damned if you do, damned if you don't. 1. How academia screwed you over. ~Well, you want to relive your postgraduate years? Or even better, the wasted years before you said, "Screw it!" and bailed. Revel in the masochistic torture. 2. How your family baggage drags you down. ~The good, the bad, and the ugly. Family, there's nothing like it. A year into our dating, Eric says he wants to understand me and not just from a distance or through what he calls my ten-inch thick bulletproof glass. Behind this glass, he says, he found more glass. 3. How as a female there is a constant battle between self and couplehood, a sacrifice of self. ~The choices of a relationship or no relationship. That moment when you realize that you're both not on the same track anymore and veering further off course from each other. Love and caring has nothing to do with the impending failure--you're drifting. All three together? The triumvirate of relationship silver bullets. You're going down. I don't know if this is interesting to others or not. Anyone who's been through the grad student process is going to feel empathy, the science focus is how it's framed, but the underlying strains aren't different. You know, the circle jerk of academia. I guess the unique viewpoint is more the Chinese American lens. The stereotypes and the cultural differences, especially the familial obligations and deference of self for the whole, which is in many ways antithetical to the American ideal that is sold as the gold standard. Then, there's the issue of being female and trying to determine yourself as a separate entity from your significant other. The struggle to be a Person and not just part of a couple. I like the discussion about it between two friends; their different lives and choices. Please just stop and let me catch up. How do you expect me to marry you if you never let me catch up? This isn't a happy story. Then again, a lot of life isn't. Definitely worth reading if ANY of the three points above interest you. The optimist sees the glass half full. The pessimist sees the glass half empty. The chemist sees the glass completely full, half in a liquid state, half in a gaseous state, both of which are probably poisonous. Take an unnamed narrator – the daughter of Chinese immigrants and a chemistry Ph.D. student – with a compellingly fresh and authentic voice. Add in a ton of ambivalence that reveals itself in her conflicted attitude toward her career and her love life. Toss is a bit of arcane chemistry trivia and some profound comments about creating a life with meaning. What you end up with is sheer chemistry, and Weike Wang succeeds in crafting a book that’s genuinely soul-searching and compelling, a book that Take an unnamed narrator – the daughter of Chinese immigrants and a chemistry Ph.D. student – with a compellingly fresh and authentic voice. Add in a ton of ambivalence that reveals itself in her conflicted attitude toward her career and her love life. Toss is a bit of arcane chemistry trivia and some profound comments about creating a life with meaning. What you end up with is sheer chemistry, and Weike Wang succeeds in crafting a book that’s genuinely soul-searching and compelling, a book that captivated me from the very first sentence. The young 20-something narrator is trying to balance her own personal reality with unrealistic expectations from a demanding mother and father, her prestigious Boston-based chemistry program, and Eric, her wunderkind boyfriend, destined for career stardom, who can’t understand her aversion to committing to a future together. At times wry, at times comedic, the book achieves an unexpected poignancy as the narrator wrestles with the possibilities and self-created obstacles that compose her life. The metaphor is clear: replicating known reactions in the science of chemistry have no bearing on the chemistry of personal relationships and of life in general. As the tormented narrator wrestles with the weight of parental expectations and career aspirations, Eric – who was lovingly supported and cheered on by his own caring parents – finds the path forward much easier. I don't understand the rave reviews of this book. Yes it was quirky and original, but for me it was definitely lacking readability and interest. This was fine - a short, quick read that follows a chemistry PhD as she struggles with her next steps in life. I liked the writing style and was drawn into the family drama, but ultimately the story was fairly bland and it didn't leave enough of an impression on me. I think this book could be great if you were in the right mood to really sink into the writing and inhabit the main character, who is by turns inspiring and frustrating. It will also depend on how you feel about the science metaphors This was fine - a short, quick read that follows a chemistry PhD as she struggles with her next steps in life. I liked the writing style and was drawn into the family drama, but ultimately the story was fairly bland and it didn't leave enough of an impression on me. I think this book could be great if you were in the right mood to really sink into the writing and inhabit the main character, who is by turns inspiring and frustrating. It will also depend on how you feel about the science metaphors on every other page. Some felt important and true, while others felt gimmicky. At least it's a different flavor of MFA writing. The family and the story of the second-generation immigrant is what made this book different, at least for me, and so I didn't need to end on (view spoiler)[the maybe-resolution with Eric (hide spoiler)]; I wanted something more with the parents. I particularly liked all of the musings on language and how it impacted the different relationships - the conversation between Eric and the mother was my favorite, and I liked that her cousin had to tell her how to say "cool" in Mandarin ("you talk like your parents! old-fashioned!"). I realize that the romantic relationships interact with the familial relationships, and (view spoiler)[that's the point of the ending (hide spoiler)], but I just found the exploration of identity so interesting that I wish more of the book had focused more on that. Oh how I loved this charming read. It starts out funny and quirky, and quickly reaches such emotional depth that I was lightly crying for the last 1/4 or so. Proof that one doesn't need flowery language or major tragedy to create a poignant, memorable story. There's been a lot of hype for this one--every ounce deserved. So I'm kind of surprised about this book. Usually I find the PYTs like Weike Wang to be less alluring than my peers and taste-sharers, but it seems that the relationship was inverted this time around. Most of my GR friends were unimpressed by this, but I really liked it! Wang describes the life of a disenchanted graduate student in dreary, boreal, Boston, a life I recall all too well. She does it via economical sentences, clever chemistry analogies, random trivia, and the humorous lens of depress So I'm kind of surprised about this book. Usually I find the PYTs like Weike Wang to be less alluring than my peers and taste-sharers, but it seems that the relationship was inverted this time around. Most of my GR friends were unimpressed by this, but I really liked it! Wang describes the life of a disenchanted graduate student in dreary, boreal, Boston, a life I recall all too well. She does it via economical sentences, clever chemistry analogies, random trivia, and the humorous lens of depressive ennui. The parts about the immigrant/Asian/female graduate student experience I thought were pretty stereotyped, but the wry approach to relationships, academia, infants, mismatched partners, and nuclear family dynamics really rang true for me. A well-written novel, yes, but one weakened by the blandness of its stuck-in-her-head protagonist, a young Chinese-American scientist, spinning her wheels on every level, who can't fathom why her sweet boyfriend would want to marry her. The distancing, abstract passages about chemistry, etc. collaged between the bland bits of story dulled my reading experience, and by the end I couldn't fathom why, either. Ninety percent of all experiments fail. This is a fact. Every scientist has proven it. But you eventually start to wonder if this high rate of failure is also you. It can't be the chemicals' fault, you think. They have no souls. I'm not sure how to review this book. It follows our unnamed protagonist as she waits for a breakthrough to complete her PhD in her research that just never comes. Her Chinese parents expect nothing less from her. Okay I'm not Chinese but I know so many parents like tha Ninety percent of all experiments fail. This is a fact. Every scientist has proven it. But you eventually start to wonder if this high rate of failure is also you. It can't be the chemicals' fault, you think. They have no souls. I'm not sure how to review this book. It follows our unnamed protagonist as she waits for a breakthrough to complete her PhD in her research that just never comes. Her Chinese parents expect nothing less from her. Okay I'm not Chinese but I know so many parents like that; parents that try to mold their child into whatever they want; parents that put so much pressure on them that they eventually break. You must love chemistry unconditionally. But all I can think is how I am not up for the task. She receives this advice from her perfect lab mate. And she pushes herself, she works hard but she just can't. Her character was incredibly real, she could be anyone. She was vulnerable and hurt and had no perfect idea who she was anymore. In the midst of all this her boyfriend; Eric proposes to her and she doesn't want to marry him. To our narrator Eric's life has been one without struggles; growing up he had the perfect kind of parents, he finishes his PhD without much struggle. But how can she be with someone like him? Wang's writing though easy going, the book had profound themes. What it means to be a girl working in a science field. She that touched on themes of cultural misunderstanding, an Asian experiencing racism. How we sometimes stereotype ourselves. Perfect book for summer-full of just the right contrasts. Sweet but sour. Both light and heavy at the same time. About nothing, about everything. About the Chinese, about Americans. Children and Parents, lovers and fighters. The yin and the yang, the push and the pull. Chemistry. Trying to figure it out and making a mess of it. Finding truth. Just perfect. I picked this up on a whim. I meant to read it last year but somehow the idea of reading about someone struggling through and eventually leaving graduate school didn’t quite appeal to me. What an emotional rollercoaster of a novel. I relived my grad school days, memories of my advisor who tried to push me into a science-y sub-field I had no interest in, the anxiety I felt every time I thought about anything related to linguistics for ages after my programme ended. I wish this novel had been aroun I picked this up on a whim. I meant to read it last year but somehow the idea of reading about someone struggling through and eventually leaving graduate school didn’t quite appeal to me. What an emotional rollercoaster of a novel. I relived my grad school days, memories of my advisor who tried to push me into a science-y sub-field I had no interest in, the anxiety I felt every time I thought about anything related to linguistics for ages after my programme ended. I wish this novel had been around back then. The unnamed narrator goes on a personal journey that is expressed through short – often disconnected – vignettes: she works through her complex relationship with chemistry, her (almost)-perfect-but-perhaps-not-right-for-her-at-that-precise-moment boyfriend, her Chinese parents and their demands and life stories. If reality > expectations, then you are happy.